A recent Google search brought me to a page of links to various Baltimore city directories, and I thought it might be useful to make some notes sorting out my Baltimore great-great-grandfather William Boucher Jr. (1822–1899) and his father, E. W. Boucher. As I’ve mentioned elsewhere, my mother’s stories on the Bouchers tended to dwell on their descent from the court painter François (1703–1770), but in fact the Baltimore Bouchers were musicians before they were painters, and the mid-nineteenth-century father and son were businessmen as much as they were artists. In 1845, Wm. Boucher’s music store is found at two addresses on Holliday Street, but it appears (from the directory’s “Removals, Alterations, Additions” page) that the reference is to one man, first at 11 and then at 4 Holliday Street. This edition even provides an advertisement for the music shop (at 4 Holliday), promising “Pianos, Accordions, Violins, Organs & Guitars.” All of these references are, in my view, to my great-great-great-grandfather Johann Friedrich Wilhelm Esprit Boucher (b. 1798), later known as E. W. Boucher. In 1847–48, by which time my great-great-grandfather had joined his father in Baltimore and married (in 1846) Mary Agnes O’Brien, Matchett’s Baltimore Director still lists only one W. M. Boucher, music dealer, on Holliday near Baltimore. I think this is still E. W. Boucher. Two years later, there are two listings for the Bouchers: William Boucher jr., music dealer, at 32 East Baltimore Street, and E. W. Boucher sen., musical instrument maker, at 7 Holliday Street. The following year, William Boucher, music dealer, is at the corner of Front and Baltimore Streets, while W. Boucher, musical instrument maker, is at 32 West Pratt Street. In Fagan’s Baltimore Wholesale Business Directory for 1852, E. W. Boucher Sen.’s music store is numbered 97½ East Baltimore Street (corner of Front), while William Boucher Jr. is still at 32 East Baltimore, three doors from High Street. The father offers “Pianos, Accordeons, Violins, Guitars, Banjos, Tamborines, Drums, &c. Strings of every description always on hand.” I think this is the last reference to E. W. Boucher in the Baltimore city directories. The son’s business is more opulent. At his shop will be found, “…constantly on hand, Accordeons, French and German; Flutinas; Guitars, Spanish, French and German; Violins, Italian, French and German; Violincellos, with and without patent heads; Flutes, Fifes and Flageolets in every variety ; Clarionetts; Castinetts; Bones; Drums; Mutes; Pocket Musical Boxes; Triangles; Mouth Harmonicas, all sizes; Violin, Guitar and Banjo pegs; Bows for Violins and Violincellos; Patent Heads for Guitars; Strings for all Stringed Instruments; Tuning Forks and Hammers; Bridges and Tail Pieces for Violins, Violincellos and Banjos; Pocket Music Stands ; a large assortment of Instruction Books for all kinds of Musical Instruments. “Banjos and Tamborines made to order, Wholesale and Retail. “Premium awarded at the Maryland Institute, in October, 1851. In 1853–54, 1855–56, and 1856–57, Wm. Boucher Jr. is a musical instrument maker at 38 [East] Baltimore Street. 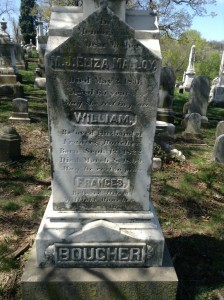 In the latter volume, Frederick Boucher, clerk, is listed at 304 West Pratt Street: I think he was a nephew of E. W. Boucher’s, later buried in the Boucher family plot in New Cathedral Cemetery. Still at 38 East Baltimore in 1858–59, for the first time Boucher’s “dwelling” is listed at 151 Cathedral Street. There we might leave him, for the moment, a successful young man in his thirties, husband of Mary, father of Sophia and Frank, little knowing what the future holds for him – a second wife and sixteen more children, among them my great-grandmother Pauline (1875–1964). See W. Boucher Jr.’s Verbena Waltz (1857) in the Library of Congress, dedicated to a relative of his wife. R. J. Matchett, Matchett’s Baltimore Director for 1847 ‘8… (1847), p. 42. R. J. Matchett, Matchett’s Baltimore Director for 1849 ’50… (1849), p. 46. The two Boucher households appear in the 1850 Federal Census: Wm. Boucher, 28, instrument-maker, living in the Fourth Ward of Baltimore with his wife Mary A., 21, a native of New York; their daughter Sophia, 1; and Fredk. Boucher, 20. E. W. Boucher is listed as Wm. Boucher, 52, musical instrument-maker, living in the Third Ward with his wife Wil[helmin]a, 31, a native of Germany, and their children Ferdinand, 9, Edwd., 7, and Adela, 1, all born in Maryland (1850 Federal Census, M432_282, pp. 41, 301). Richard J. Matchett, Matchett’s Baltimore Director for 1851… (1851), p. 37. Wm. H. Fagan, Baltimore Wholesale Business Directory, and Business Circular, for 1852, p. 170. In 1852, W. Boucher Jr.’s residence was at 25 North High Street (Walter E. Earps, Jr., Departed This Life: Death Notices from The [Baltimore] Sun, 4 vols. [1985-86], 1: 109). Not to be confused with Francis Boucher, cigar dealer, at 77 North, or Joseph Boucher, plasterer, at 46 St. Mary. Richard J. Matchett, Matchett’s Baltimore Director for 1853–4 (1853), p. 38. R. J. Matchett, Matchett’s Baltimore Director for 1855–’56…, p. 51. John W. Woods, Woods’ Baltimore Directory for 1856–’57…, p. 36. John W. Woods, Woods’ Baltimore Directory for 1858–’59…, p. 94. Mr. Steward, Each time I read a story such as yours it makes me feel better. I have often been accused of “too much detail” and “a lot of minutiae”!! in the development of my book about my paternal line (1537-1997). These kinds of “finds” give “life” to our ancestors….depth and character….so much more so than just listing their names and their progeny with a few minor facts such as their occupation. Thank you! This is a love story of this particular family/ies and I am sure the rest of your stories are equally as “colorful”. Thank you, Donna! I think there is a value in putting research into chronological order, the better to see patterns and problems. For instance, at one point I thought I had found the widow of my great-great-great-grandfather Boucher in the process of reviewing each available year of the relevant Baltimore city directories. I had not (disappointingly), but what I had done was begun to understand the unrelated William Boucher cigar-making family — helpful in not ascribing one family’s doings to another.